"This is one of my favorite marinades when we eat red meat!" In a medium bowl, mix sherry, soy sauce, vegetable oil, honey, ginger, and garlic. 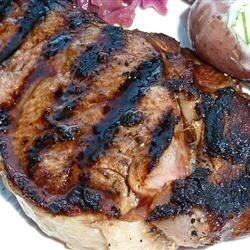 Marinate steaks for at least 4 hours before grilling as desired. With all the great reviews, I had to try this. I didn't care for it AT ALL! Very good. Everyone liked it. Used it on venison. Marinaded for 6 hours.